For Senator Bongbong Marcos to say that his father was a hero and not a thief and that his last heroic act was his restraint in not ordering the massacre of the civilians massed at EDSA 1, in February 1986 is but normal of a son and a politician. In his eyes his father is an all-time hero; and as a politician he has to engage in a conscientious image building built on lies for his future political exercise. The claim however, that his father was not a thief was belied by various Swiss dollar accounts that the Marcoses would like to put closure with by offering to surrender some deposits in favor of the government during the reign of President Fidel Ramos. The compromise was pursued during Joseph Estrada’s presidency and is being pursued now under the administration of President Simeon Benigno Aquino. Some other accounts were sequestered by the Court and money therein ordered paid to the thousands of human rights victims during Marcos reign of terror. Just like what CJ Corona claims, the Marcoses maintain that these money were “product of their own toils”, but unlike Corona, the Marcoses would want to give up some of their riches in favor of the government to sue for peace. You do not need historians to make a judgment call that the Marcoses had pillaged the economy and made use of their power to enrich themselves while the people whom they claimed they represent wallow in abject poverty. This paradox is lost on the Marcoses. Now as to the claim that the late strongman did not order the “massacre” of the demonstrators in EDSA in February 1986, let us summon historian Alfred W. McCoy to shed light on this political spin. After Balbas put down the field phone, Colonel Jerry Albano (PMA ’71) approached the Marine position at the head of an armed headquarters company, saluting and calling out, “How are you, sir?” Suspicious, the Marine said, “Prankahan tayo” (Let’s be frank). You lay your cards, I lay my cards. What side are you on?” Colonel Albano replied, “Sir, you know pretty well that I belong to Class ’71 and Class 71 belongs to the reformist movement. So, I am on the side of Crame.” Knowing that these combat Marines could slaughter his lightly armed guard unit, Albano suggested, “Okay, coexistence na lang tayo”. (Okay, let’s just coexist.” The Marine Commandant nodded in agreement and Albano withdrew. Thirty minutes later, the Marine Commandant, General Tadiar, entered the palace and met General Ver, who confirmed the order to fire. Tadiar picked up a phone and told Colonel Balbas, “I think the order of Ramas is cleared. So you may fire.” The colonel replied, “Sir, if I may, the people have been let inside Crame already, and we will be hurting a lot of civilians.” Tadiar paused, “Then hold your fire and use your discretion.” Ten minutes later, General Ramas called and, for the fourth time, gave Balbas a direct order to fire. The colonel again stalled saying, “We were looking for maps and positioning canons and mortars. Colonel Balbas got a frantic call within minutes from Colonel Irwin Ver, chief of staff for the palace guards, ordering a “full attack.” Balbas replied that he was still positioning the cannons and mortars. By now he had decided that ‘only an insane commander’ would kill hapless civilians. He was not going to slaughter his ‘superior officers, classmates and other friends inside Camp Crame. The colonel was certain that his PMA classmates, men like Oscar Florendo and Pedro Sistosa, were in there with Ramos. An hour later, sensing, as Balbas later said, that “I will turn over the troops to Camp Crame if I were pushed further,” General Tadiar ordered him to disengage and return to base. Marcos had lost his marines.” (Closer Than Brothers, Alfred W. McCoy, p. 250-52). What an informative piece! Thank you for the information. I thought Ramas is good person & so us Tadiar! So , it’s Col Balbas who prevented the bloodshed! Bless him & his family & their generations to come. napaka talino nyang presidenti pag nag k kwintuhan kami ng parents ko about past totoo po to na si mr:ferdinand marcos na ang nag pa angat sa mga pilipino. naging mahigpit po talaga sya nun pero para sa ika bubuti ng mga pilipino un deciplina at ndi ka daw matatakot pmunta sa ibang lugar at kunti ang abosado walang mga foreigner na nag mamay ari ng lupa dito sa pinas wala daw ngapo nag ta trabaho nun sa ibang bansa at may libre pa daw na gatas nun sa skwelahan. 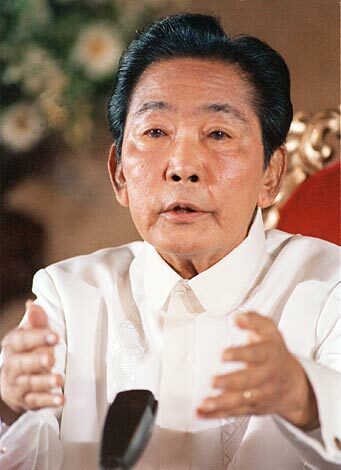 !nagiging emotional ang parents ko pag pinag uusapana nakaraan…dahil sa yaman ng pilipinas sa pag kain..SO SAD NA NAWALA SI MR:ferdinand MARCOS…hayyyssss!rest in peace po…..salute po sa lahat ng ginawa nyu. but please read primitivo mijares’s ‘conjugal dictatorship by ferdinand and imelda,’ sterling seagrave’s ‘marcos dynasty, alfred mccoy’s ‘closer than brothers,’ raymond bonner’s ‘waltzing with a dictator,’ rempel’s ‘delusion of a dictator’ and other publications not funded by malacanang. after reading the books i have mentioned here and you still admired F. Marcos, then it must be the reason why we keep electing the marcoses back to power. Indeed, it only hurts the most when we laugh. For those old enough to live through and recall those grim years, we had choked on Imelda, God spare us now from her verbosity and frivolity. I met her twice when she opened exhibitions at our Solidaridad Galleries in the late 60s. Marcos was serving his first term. I picked her up at Malacañan; she didn’t know me from Adam but she did her homework. At the gallery, I talked to her about Filipino art and she was absorbing everything. She was a fast learner and soon, she had us cultural workers in Malacañan where she spoke about her plans for a Cultural Center. And there it is the fascist complex that she built, the “suppository” of Philippine culture. We’ve always attributed to Imelda part of the good fortune of our visual artists. At those two Solidaridad shows, for instance, she brought along her Blue Ladies and camp followers who, at her urging bought paintings. Then it became fashionable for the rich Filipinos to patronize Philippine art, adorn their houses with Filipino antiques. Since then, it was possible for the better painters to make a living on their work. Until Imelda came, it was only Amorsolo, Botong Francisco, Vicente Manansala who could live on their paintings. Today, if Malang, Ang Kiukok, and others are millionaires, it is due not only to their talent but to the trend in patronage that Imelda started. Too, Imelda promoted the theater, the grandiose festivals, the great Roman parades that challenged not just the creativity of our people but also their sense of community. She ignored the writers, however, because they are elitist. I’m sure she did this because she does not read. Sure, Imelda had some vision, no doubt inspired by Jackie Kennedy’s efforts in America. Her “edifice complex” brought about a frenzy in beautifying towns; at times this obsession with facades deteriorated into “Potemkin villages,” hiding the slums behind white picket fences and, in Tondo, a false front of handsome chalets before the hovels of the poor. So some theater people and some well-connected cultural workers look back at the Marcos years as their golden age. What we have completely forgotten is that Imelda is the other half of the Conjugal Dictatorship that ravaged this country for two decades, that stashed billions of dollars; our money in foreign banks, squandered this in shopping trips and in the purchases of real estate everywhere. What we have forgotten is that in these 20 years, thousands were imprisoned without trial, tortured and killed, two rebellions started and hindered our development. What we have forgotten is that this Conjugal Dictatorship started the diaspora of millions of our countrymen to countries where they are maltreated and debased. What we have forgotten is that this Conjugal Dictatorship deformed our military from the citizen army that fought with courage and sacrifice in Batasan and in the guerilla war against the Japanese. What we have forgotten is that this Conjugal Dictatorship sunk us into the bog of dependence on the United States. Where, after all, did the dictatorship get its support but from Washington. And worst of all, this Conjugal Dictatorship exacerbated our moral decay from which we have yet to recover. When the terrible earthquake devastated Northern and Central Luzon in 1981, I was told that the Ilokanos beseeched Divine Providence, saying Marcos and they had committed no sin, that it was all Imelda’s fault. She came from the Visayas and the Visayans are known for their flamboyance and profligacy. Of course, all those stupid Ilokanos were wrong, their tenacious attachment to Marcos is ethnicity dragged down to its lowest level of absurdity. Maganda daw ang pamumuno.. Please read other sources.